This week is all about Jennifer Wong! We've been lucky enough to have Jen teach several workshops for adults and children alike including Young Architect Workshops, Lighting Design for Adults, and Scotch + Succulents among SO many others! She's so talented in the way she approaches making modern architecture and design applicable in her workshops! Read on to learn more! Jennifer Noel Wong is a native Angeleno. 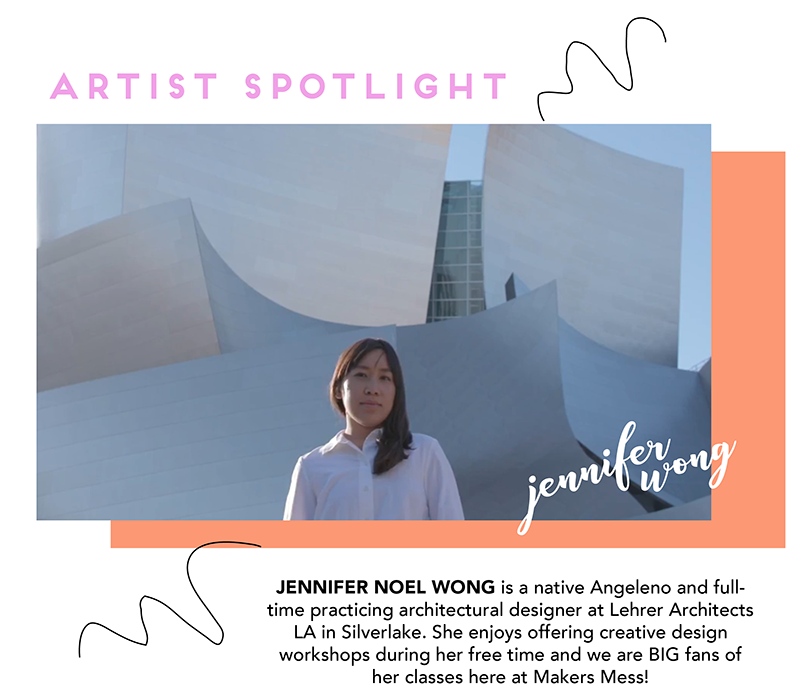 She's a full-time practicing architectural designer at Lehrer Architects LA in Silverlake, and enjoys offering creative design workshops during her free time. Her workshops are mainly geared toward kids ages 7-12, but has started to offer adult design workshops after parents started showing interest too. She finds influence from her surrounding environments, and learns from architects who create built spaces and approach design by challenging themselves to push boundaries, conduct social ecological research, and address sociological issues of today. The workshops she offers (at times with her creative and talented friends like Rutd and Dorsey Lampworks) focus on creative problem solving, designing within constraints, working with the strengths and weaknesses of materials, and translating technical solutions to qualitative means of interactions that happen within spatial boundaries. Follow Jen on instagram @curatedtravels for more design inspo + workshop notifications!